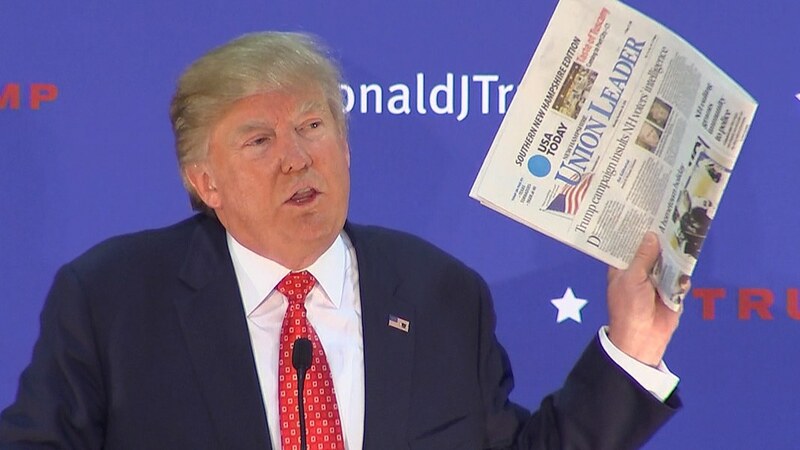 NASHUA, N.H. – Donald Trump referred to the biggest newspaper in New Hampshire as a “pile of garbage” Monday night after the New Hampshire Union-Leader ran a front-page editorial calling him an insult to the intelligence of voters in the state. Speaking to a crowd of more than a thousand, Trump railed against the paper’s publisher, Joseph McQuaid, who wrote the editorial. Trump repeated earlier claims that McQuaid asked him to write a tweet in favor of Chris Christie's inclusion in a prime-time GOP debate. “Maybe it has more power than I think, but honestly I watch this guy… he’s a loser,” Trump said of McQuaid. 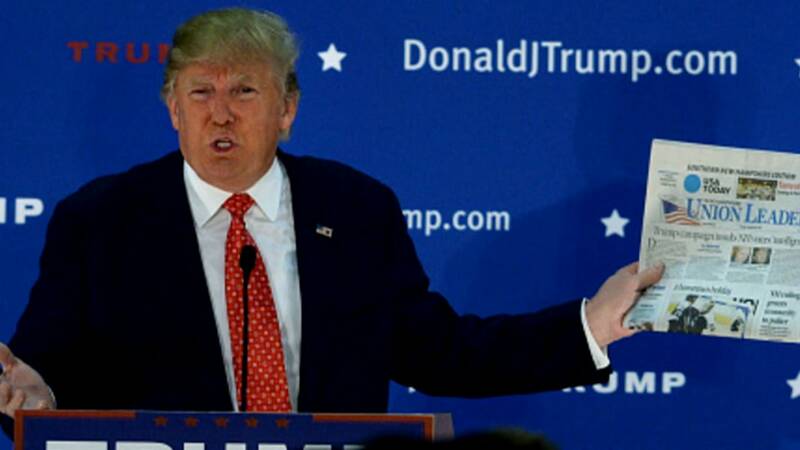 Trump claimed that McQuaid told him he would not endorse Christie because of the New Jersey governor's embrace of President Obama after Hurricane Sandy. The Union-Leader gave its endorsement to Christie just after Thanksgiving this year, helping Christie garner higher poll numbers and increased attendance at his rallies in the Granite State. But the editorial board of the New Jersey Star-Ledger, Christie's home state newspaper, wrote that the Union-Leader made a mistake in endorsing Christie, Trump noted, right before launching into attacks on New Jersey’s economic record, the state’s credit downgrades under Christie’s tenure, their high taxes, and then the scandal over lane closures at the George Washington Bridge. After the event, speaking to an overflow room, Trump teased that his campaign will start spending more money next month. At one point, the event was interrupted by at least one protester shouting “fascist!” and then a scuffle ensued as a “celebrity wrestler” named Todd “The Punisher” Poulton started taking him down in the middle of the crowd. The police quickly removed the protester. 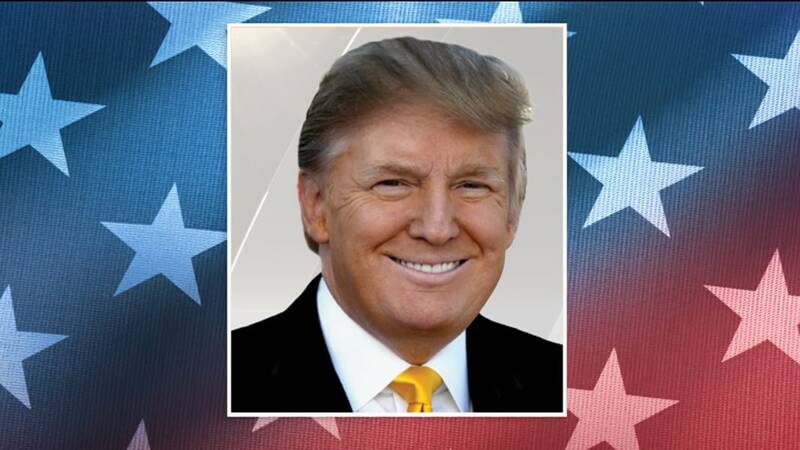 Trump also got the date of the New Hampshire primary wrong while he was urging the crowd to get out and vote – calling it February 8th, before the crowd corrected him to the right date of February 9th. On MSNBC’s “MTP Daily” Monday afternoon, McQuaid said he expected blowback from Trump and that the real estate mogul turned on him after it became clear he would not win the paper’s endorsement. “He wrote me a letter two days before the debate saying he was a great judge of business and his instinct was that I was not going to endorse him so he wasn't going to do my lousy event," McQuaid told MSNBC’s Steve Kornacki.